For the last fifty years, Mustang owners have been modifying their vehicles for more power, in the form of bigger engines, nitrous oxide, superchargers, or even turbochargers. Early Mustang owners had it easy – a new fuel pump, maybe some bigger lines, and a bigger carburetor did the trick, but late-model Mustang owners have had challenges in upgrading the stock fuel systems for more performance. The car we’re tuning up in this article is a beautiful ’92 notchback that has had some upgrades performed in the Power Automedia shop previously. 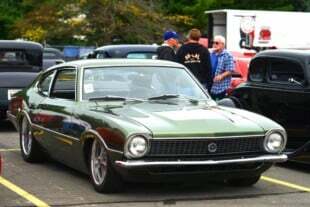 Back in 2012 we installed a full Maximum Motorsports suspension underneath and just a short time ago we tuned up the power-handling capability with an AOD-to-TREMEC T56 Magnum swap. This notch is a sleeper of the highest order. It still utilizes the low-mile stock long-block, but has been tuned up with a killer cog-driven Vortech T-Trim supercharger and makes in the neighborhood of 475 horsepower at the rear wheels. Previously, the fuel system consisted of a mish-mosh of stock and upgraded components, including 42 lb./hr. fuel injectors, stock fuel rails and lines, a stock-replacement 255 liter-per-hour fuel pump, a fuel pump voltage booster, and an adjustable fuel pressure regulator. As you can see, upgrading the car to a better fuel system would allow us to maximize its capabilities while providing the peace of mind when it’s time to romp on the loud pedal. Left - The underside of our new pump is covered in stainless-steel mesh to provide an extra layer of filtration, as the pump bottom sits in the baffled area in the tank. Middle - The complete Aeromotive Stealth Fox Body fuel system as it arrived at Power Automedia - all of the fittings, hose, and every other part we'd need for installation. Right - The pump bolts right into the new tank and uses AN-08 feed and AN-06 return lines. Thankfully, Aeromotive is on the scene with their brand-new Fox Body Stealth A1000 drop-in fuel system [PN 17130] that utilizes an in-tank version of their well-known A1000 fuel pump. Installation of the all-in-one system simplified the project’s downtime for us, as every single piece we needed for installation was included in the box. The next step was to engineer a complete drop-in fuel tank that would accept the A1000 and Eliminator fuel pumps, to allow for a one-stop-shopping experience and simplify the task of upgrading the Fox fuel system for more performance. The new tank is not a clean-sheet design; instead, Aeromotive took an existing design – the 2003-’04 Cobra tank – and modified the platform to work with those top-mount pumps. Left - The fuel level sender attaches inside the tank and uses level sender wires that are attached to the new pump. 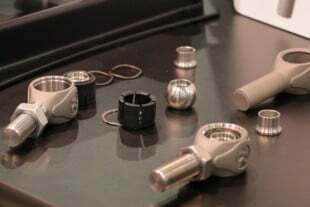 Left Middle - The use of a bench vise is a big help when it comes to assembling AN fittings. Right Middle - The top of the tank assembled, the pump in place, level sender wired up, and the pre-filter installed to the tank shield. Right - Another view of the 100-micron pre-filter mounted on the shield. 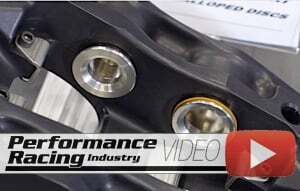 Aeromotive provides the sleek billet brackets in the kit. “The 2003-04 Cobra tanks were a very popular upgrade for the Fox Body. We got our hands on one and realized that it was a very well-designed tank with an outstanding baffling system. We got wind that Ford was going to discontinue them, and with Ford’s blessing, we went out and sourced the fuel tank design. We made a few modifications to the design to assure that it would fit into the Fox Body and built our A1000 and Eliminator fuel pump designs with a top-mount plate, and engineered them to fit into the tank as a direct drop-in,” says Powell. Baffling is an upgrade on the original Ford design of the ’03-’04 Cobra tank. It’s difficult to see here, but we can attest that it simply works as designed and keeps fuel surrounding the pump at all times. The comforting design aspect is that there is no sump hanging out of the back of the fuel tank, no fuel pumps to mount to the frame rail, and no concerns about gravity-feeding the fuel pump. In fact, it’s stealthy – thus the name. The stock fuel tank straps are re-used, as is the stock fuel tank cover, lending no indication to someone standing behind the car that anything has been modified. Once the new tank is hung into the car, nobody would ever suspect that hiding inside is a seriously capable fuel system. Unlike solutions of years past, you just can’t see it. In addition, since the pump is mounted inside the tank, it’s substantially quieter than a comparable externally-mounted pump would be. With the baffling that’s built into the tank, there are also no concerns about uncovering the fuel pump pickup during hard launches or hard cornering – this system truly solves all of the previous issues Fox Body owners could encounter when upgrading the fuel system. As part of the kit, Aeromotive also includes every other item you’ll need to finish plumbing the fuel system – an EFI bypass fuel regulator [PN 13109], regulator-mounted fuel pressure gauge [PN 15633], AN-08 braided stainless-steel fuel supply and AN-06 return lines, a 100-micron stainless steel pre-filter [PN 12305], a 10-micron post-filter [PN 12301], a 2-inch billet filter bracket [PN 12305], the ’86-’95 5.0L GT and Cobra Fuel Rail Kit [PN 14101], a complete fuel pump wiring kit, along with all of the necessary fittings, hose clamps, and self-tapping screws. Plenty of fittings here to plumb the entire system fron front to back, including all of the specific ORB (o-ring) fittings required for the ends of the filters. You even get all of the clamps necessary to hang the line under the car. “We’re offering these kits a few different ways – as the tank with either the A1000 or Eliminator pump if you have an existing fuel system that’s already been upgraded with larger lines and fuel rails. Next, you can buy it as a complete system like we’ve detailed here, or we sell the pumps individually that will drop right into the ’03-’04 Cobra tank. It’s a direct fit into those cars,” Powell explains. The Power Automedia shop team took care to route the hoses away from exhaust components that could heat up the fuel. Left - Prior to hanging the tank back in the car a bit of wiring is done to the top of the pump. Right - Aeromotive provides the new relay and circuit breaker for use in wiring up the new pump. 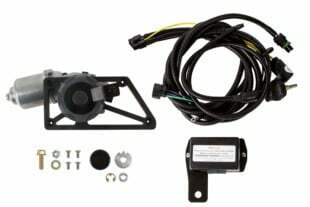 They also provide directions for utilizing the factory pump trigger wires, wiring up the new pump, and all necessary elements to complete the task. What Else Does It Fit? Fear not, engine swappers. The Aeromotive gang has seen fit to engineer the entire system to work with nearly every Fox platform and a variety of engines. 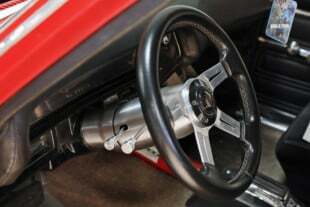 The kits are adaptable to the ’96-‘98.5 4.6-liter engines with the selection of the proper fuel rail kit, and it fits the ’79-’85 Fox as well with the addition of an ’86-later fuel level sender and a 73-10 Ohm gauge. Kits are in development for the ‘98.5-2004 GT platform, so Aeromotive can cover the entire range of Fox-platform Mustangs. You can also use the same part number for the Fox kit to do a Coyote/Fox swap or 5.4L/Fox with the addition of the correct fuel rails. See the Aeromotive website for more information. As every item required for installation was in the box we opened up, it wasn’t nearly as difficult as it might seem to get all of the parts and pieces installed into the car. Although we’re not going to cover the complete install as Aeromotive provides a great set of instructions, here’s a short overview. Since the pump is already mounted inside the tank for shipping purposes, you’ll need to take it out in order to swap over the factory filler neck grommet, fuel level sender, vent and vent grommet to the new tank. The pre-filter bracket gets mounted to the front of the factory tank shield using the supplied carriage bolts. The filter gets installed into the bracket, and a fitting is screwed into each side of the filter. Attach the wiring to the level sender per the instructions, install the correct fittings into the ports on the tank hat, put the gasket onto the tank mounting ring and position the pump assembly into the tank, then lock it down. At this point, you have to position the tank shield underneath the tank to determine the length of hose you’ll need to connect to the pre-filter. Build a small section of -08 supply line to do so, along with a piece of -06 return line and connect them to the pump’s inlet and outlet using the provided fittings. A comparison of the stock tank we removed (top), and the new-design Aeromotive tank (bottom). Visually, there isn’t much difference other than the billet hat on top of the A1000 pump, but inside is where the magic happens. It’s also time to connect the wiring; you’ll have to snip the factory harness to connect two of the wires to the A1000’s connections. Mount the fuel pump relay near where you removed the factory plug. Also, mount the circuit breaker as close to the battery as possible, and finish up the wiring connections per the instructions. Replace the tank, and it’s time to move to the front of the car. First, find a suitable place to mount the fuel pressure regulator – in our car, we put it on the passenger-side fender apron, where the air intake used to be. Next, pull off the upper intake manifold, disconnect the factory fuel rails (you’ll need the a special tool for this, available at your local auto parts store) and disconnect the injectors. 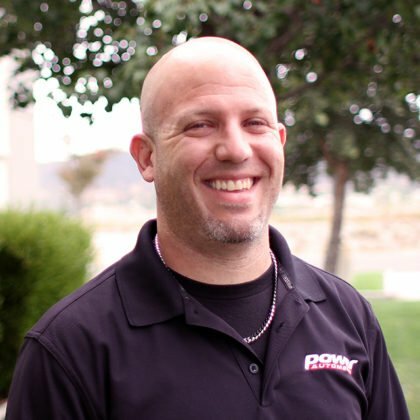 We’ll assume you’ve done this before, so the next step is to install the new fuel rails, taking care to ensure that all injector o-rings are still in their assigned locations, and bolt it all back together. We mounted our new fuel pressure regulator on the passenger side fender apron for easy plumbing and visibility of the pressure gauge. Right - Our new fuel rails in place atop the existing 42 lb./hr. fuel injectors. Owner Eric Schumacher reports much greater fuel pressure consistency, and that the new pump design just works, where the old one could be heard cavitating when the car went around turns. As an aside, when installing new fuel rails onto a Fox Body, you’ll need to set the car up with one of BBK Performance‘s 3/8-inch-thick phenolic spacers [PN 1508, stock manifold] to achieve the required clearance for the rails underneath the manifold. They make spacers to fit the stock manifold, the TFS intake manifolds, Edelbrock Performer manifolds, GT40/Cobra, and BBK SSI/SSI-R manifolds. The phenolic material adds a bit of performance as well by reducing heat transfer between the lower and upper manifolds, which helps produce lower inlet temperatures. We needed one of BBK’s 3/8-inch phenolic spacers for the stock manifold in order to raise the upper half of the manifold to clear the new fuel rail assemblies. These spacers give the added benefit of preventing some heat soak to the upper manifold. Follow the provided instructions for mounting the regulator, connecting all of the fuel lines to their respective places, and wrap the installation up. Fill the new tank with fuel and check for any leaks at this point. If there are none (and there shouldn’t be), reconnect the battery and cycle the key to the ON position, then check to see if you have fuel pressure at the regulator. Once the gauge registers pressure, start the car and adjust the pressure to your desired setting. Test-drive the car to ensure proper operation, then come back and check for leaks again. That’s it – your fuel system issues are now a thing of the past, thanks to the fuel system experts at Aeromotive!